House Speaker John Boehner of Ohio, joined by Senate Majority Leader Mitch McConnell of Ky. on Capitol Hill. Congressional Republicans are running out of options to pass a Homeland Security funding bill that blocks President Barack Obama’s immigration orders, raising the threat of another showdown that could idle parts of a key government agency. With a Feb. 27 deadline looming, Republican House and Senate leaders have been unable to agree on a strategy to extend the spending authority of the agency charged with securing U.S. borders, airports and coastal waters. A House-passed version of the spending bill would de-fund Obama’s 2012 and 2014 executive orders lifting the threat of deportation for millions of undocumented immigrants. But Obama has threatened to veto the House bill, and Democrats have blocked Senate consideration of it in three separate votes. The dispute has opened up Republican divisions and left the party with unpalatable options: partially shut down the agency that leads domestic counterterrorism efforts, pass a short-term extension that postpones the fight or set aside the immigration battle with Obama and approve a “clean” funding bill. 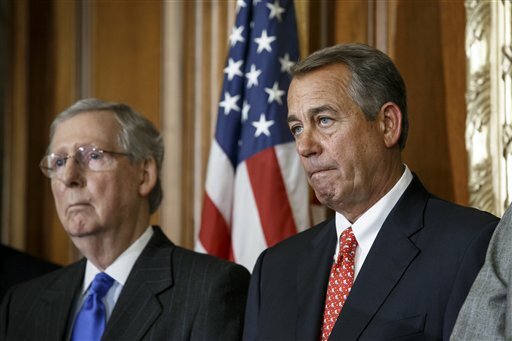 The eventual answer could offer clues to the leadership approach and abilities of House Speaker John Boehner and Senate Majority Leader Mitch McConnell, who have promised the new Republican-controlled Congress will get things done while confronting Obama. Lawmakers left town on Friday on a 10-day holiday break with no movement from their entrenched positions. Conservatives are demanding that Republicans stand firm in challenging the immigration orders, which they see as another sign of the president’s constitutional overreach. “I believe Congress unfortunately is in a position where it cannot acquiesce — because it acquiesces in a long-term alteration of the power relationship, and it acquiesces to an unlawful act,” Senator Jeff Sessions, an Alabama Republican, told reporters in a Capitol hallway. “The president has put us in a position where it’s going to be difficult to maneuver a way out,” Sessions said. Some Republicans say the impact from a DHS funding lapse would be minimal, as the department would continue its core protective functions. See Factbox. But a few moderate Republicans, who have seen the party get blamed for past battles over shutting down the government, are beginning to say a “clean” bill is better than a shutdown. “I’ve been in this position before. We’re going to pass a bill at some point that funds this and some of us are going to be accused of being capitulators, surrenderers, squishes,” said Representative Charlie Dent of Pennsylvania. Democrats said Republicans have painted themselves into a corner where the only way out is to climb down or cut off funds to Homeland Security. “They’re in a fix. Let’s see how they get themselves out of it,” House Democratic Leader Nancy Pelosi said of Republicans. Tea Party conservatives say their constituents disapprove of Obama’s immigration actions, and that Democrats will take the blame if Homeland Security shuts down. Giving up would produce an “uproar” from voters, Republican Representative Raul Labrador said this week. Some lawmakers hope for a reprieve from a court case in Texas, where a federal judge has been asked by over two dozen states to block Obama’s 2014 immigration order. Republican Representative Mick Mulvaney of South Carolina said that if the court rules against Obama, it would be appropriate for lawmakers to consider funding DHS at least while the court injunction is in effect. In the meantime, compromise has been elusive. Last week Republican Senator Susan Collins of Maine proposed a compromise that would only block Obama’s 2014 immigration order and not his 2012 order, but she has found no Democratic takers. Not to their constituents. Those already in the money are gleefully making more. The public can go jump in something. So, we place all of our domestic and international intelligence functions under Homeland Security and leave its funding en toto to idiots like John Boehner and Mitch McConnell. Did we learn nothing from the last government shutdown? Did we do exactly the wrong thing after 9/11? Republicans have become a fifth column in the United States and are becoming a clear and present danger. Once again, it was not unlawful, but part of the president’s power of the pardon and has been since the 19th century. Which the Republicans know full well. If they really thought it was illegal they’d be trying to eliminate the amnesty power altogether, but I doubt they want to do that since it would also eliminate the possibility of a Republican president ever using it.